I picked up this case along with the 7″ Kindle Fire HD based on the description of the product and the fact that it is produced directly by Amazon, opposed to the 3rd party options like Marware that were the only options back when the original Kindle Fire was released. So far on day 1, i’m extremely pleased and happy with the construction and quality of the case. 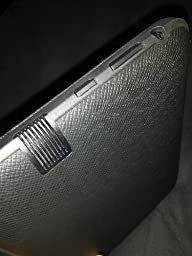 The main body of the case is a hard plastic shell, with speaker grills cut out for the speakers on the Fire HD, and plastic buttons for power and volume. The plastic is somewhat flexible and can bend a little bit, but looks strong enough that it wouldn’t easily snap or crack if it dropped. The Fire itself slips right in and is held in pretty well; I can turn the case upside down without worrying that the Fire would fall out. The flap for the cover is lined with a soft cloth to protect the screen, and also looks like material that won’t fray anytime soon. Magnets look like they’re on the corners of the device to keep the cover in place, and are strong enough that the flap won’t open on it’s own. There’s a small rubber tab on the end that makes it easy to open as well, and allows the HDMI and USB ports to be exposed so that it can be plugged in while charging or connected to a bigger display. Smart design. The outside cover feels like a tough leather; it feels nice and it too doesn’t look like it would scuff easily. The feature that wakes the Fire upon opening the flap or puts it to sleep when closed works flawlessly. The buttons on the case actually make it easier to press the power button, which is a common complaint on the Fire HD since the power button is flush. But with the auto wake and sleep on the case, it probably won’t be as big of a deal. The case “stands” by just making a tent shape, opposed to being propped up the way other cases are designed. This actually works pretty well, as the rubber on the case edge keeps it sturdy and stable, and lets you adjust angles without a problem opposed to pre-defined angles or notches in other cases. I’m extremely happy with the case, but the only reason it doesn’t get 5 stars is the price. Paying almost 1/4 of the price of the Fire HD itself for a case is pretty steep, despite how nice the case actually is. I’d gladly give this case 5 stars if not the price. Should really be around $30. It fits the Fire HD like a glove, leaving all ports, microphone, etc. exposed for easy access. It’s solid, well built, and as a nice bonus, when flipped fully open with the flap all the way flush to the back, but would be even better if it would attach to the back somehow and stay there. It has a magnetic latch when closed, so it does not open when you don’t needed for it to be opened. The edges of the case and inside is plastic that is robber coated, so it gives a great feel. The stand position is very unstable but can be used for watching a movie. I’ll briefly summarize the things that work for this case to reinforce what has been stated already. That it is from Amazon itself and designed for the Kindle. The fit is snug, it is light, has a much better texture and feel than is conveyed in the pictures. The awesome sound from the speakers is unobstructed and the magnetic lift-to-wake lid is a nice touch, with convenient case cover buttons for the volume and power buttons. However one of the key uses of the fire for me is to watch shows or videos while multi-tasking in the kitchen. So the fully adjustable stand position at first appeared as a positive. 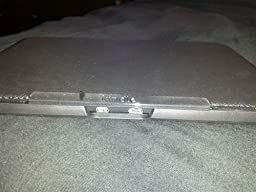 Then the flaw appeared,on smooth surfaces such as a granite counter or wood table the lid slips out from the back causing the kindle to fall flat on its back. This has happened repeatedly, and even when the lid is against another object, then the front will slide out. For how much this case cost (a quarter of the device price) this is unacceptable. If I can’t figure this out without some tacky workaround like taping something on, this will likely go back. I will be trying out some other cases to see how they work.